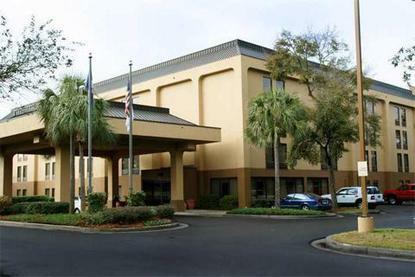 Hampton Inn Charleston/Mt. Pleasant-Patriots Point is 2 miles from downtown Charleston and 6 miles from the ocean and public beaches. We are 3 miles from Charleston Museum, the oldest museum in the US, 4 miles from Mt Pleasant Town Center and 1 mile from Patriots Point Military Museum featuring USS Yorktown. We are 10 miles from Charleston International Airport and about 15 miles form Historical Plantations. We feature 121 rooms, outdoor pool, passes to an offsite health club, gold packages, and meeting facilities to accommodate 20 people. Amenities include complimentary continental breakfast, voice mail, and TV with cable. We also offer connecting rooms, cribs, hair dryers, irons, and dry cleaning service. Babysitting/child services, laundry/valet services and meeting/banquet facilities are available for a nominal fee.